Congratulations to our winners: Mia F. from Orlando, FL (HP Photosmart printer) and Kimberly B. from Vancouver WA ($50 Snapfish giftcard)! If you're looking for a new printer for a child heading back to school or need an upgrade of your own, enter our HP giveaway for a chance to win a HP Photosmart e-All-in-One printer or $50 Snapfish by HP giftcard. The HP Photosmart e-All-in-One ($99 MSRP) does it all. It prints beautiful photos that dry instantly and can last for generations; has a built-in flatbed scanner; and is wireless, so you can print from any room in the house. Plus, the HP Photosmart e-All-in-One has a unique trick up its sleeve — with ePrint technology you can set up a customizable email address to print from anywhere in the world. Send pictures to your child at college to let them know you're thinking about them, or print documents while on the road and they'll be ready for you when you get home. With a $50 Snapfish by HP giftcard, you can create school supplies like a personalized notebook, make a photo mousepad with family or vacation memories, and add personality to your gear and gadgets with photo skins! Enter our HP giveaway through September 16th, 2011 for a chance to win. Tell your friends about the Techlicious Newsletter and for each one who signs up, you'll get an extra entry, up to five additional entries! We will randomly select two (2) winners from the entries, one will win the HP Photosmart Printer and the other the $50 Snapfish by HP giftcard. No purchase is necessary to win. The giveaway will end at 11:59pm on September 16th, 2011. Void where prohibited. U.S. residents only. Click here for the full rules. Color Laser can't do what HP can! I purchased an expensive color laser printer. Love it, don’t get me wrong, bit I found out too late that it won’t do glossy OR matte photo paper! Since I do tons of photography and like to print my photos, I have to then pay to do so @ Kinko’s…..both a money and time sucker. I sometimes switch to my older HP but it’s getting way slow at printing these and the tecnology just can’t keep up! I would use the printer to help me enhance my photos to share with friends, family and with the photography club that I just joined. I am learning new techniques and it would be very exciting to print them out with the new HP Photosmart. I would just love it!!!!!!!! . . .often to re-gift, but there’s nothing wrong with that. I have friends/family that would love a photo printer and even more ideas for folks who’d make good use of a snapfish giftcard (including me!). I would love to win this printer and/or gift card! Thanks for teh opportunity! I would print and send photos of my 4 year old to his grandparents year round instead of waiting until birthdays or christmas to send gifts. I have so many digital photos but do not get around to printing very many of them. This prize would mean new pics on our walls and at my desk at work. I’ll also be able to get photos of my son sent out to all the family members who give me a hard time about it all the time! Already a member of Techlicious! Please enter me in the HP giveaway. Ciao! I would love to have this printer to print out so many pictures and frame them and give away as gifts or maybe even sell my photos that are framed. Thank you for this giveaway. to print Thank You cards and Family newsletters with photos for the holidays. I would love to have this printer to keep up with pictures of my daughter and grandaughter who live thousands of miles away from us. I have an older HP printer but it is getting very cranky and unreliable. It certainly does not have the great features of this new one! I would use the printer and/or Snapfish gift card to make prints and slideshows/photo books of the boy of course. He’s five. Today was his 1st day of kindergarten. I’m transitioning my business from being simply self-employed to creating a model. It’s a part of a bigger life transition that involves care-giving for a family member. No violins, please. This morning I woke and decided that I needed some breaks in the areas of my life that count and this is one of them. Winning the HP printer will save me money, time and to be honest, make me feel freakin’ special. "How would you use your new HP printer or Snapfish giftcard?" If I wont the HP printer I could print my own photos for scrapbooking or with the Snapfish giftcard I could just order my photos. Love to use the Snapfish gift card to make photo books for my kids. Thanks for the giveaway! With the volume of printing required by professors these days, a new HP printer would come in real handy. Having the convenience of a fast, capable home printer is hands down preferable to spending hours in a computer lab on campus. We could sure get some use out this one! With Snapfish and teens, the sky is the limit for personalization of their ‘stuff’. I would use the printer to print copies of my photos to share with my family. What a great printer! The one I have is ancient and if I won this, I would print my wedding pictures (from 8 years ago!) and order some fun things with pics of our dogs from Snapfish for my husband and his kids. I would use the HP Photosmart Printer to print the many beautiful photos that my daughter takes. In addition, I would print photos that I have taken and use them in various art projects, and of course, share pictures of my daughters with my family. My girls bring home many fragile art projects created at school. I would take photos of these art projects and save the photos instead of the short lived projects themselves. Particularly the ones made with beans and macaroni! The gift card would go a long way towards facilitating these plans. I’d use the HP printer as my default printer at home. I’d use the Snapfish gift card to send photos to my parents, who are in their 80’s and who don’t have a computer/internet. I would use the printer to print some of the grandchildren’s photos. The printer we have doesn’t do them justice! I would use the printer to create an album of the many digital photos that I have not printed. Hi! I would LOVE a new printer. The one I have now only prints in b&w and if I could actually print photos, that would be amazing. Thank you. I am a Techlicious subscriber. I would love to win the printer! I would use it to print off coupons from the internet to save money, and to print pictures and letters to give/send to family and friends. I wish I win the printer and Snapfish, I’m 70 years old and want to take pictures of my sons, daughters and grand children and print them out. If I were to win this printer, the best part would be the wireless feature. Then I could print my photos from my iPhone directly to the printer and not have to download or email them to my desktop. I have 3 girls and my family is complaining that they never get enough pictures of them. With this printer I would be able to scan the pictures I already have and create as many copies as necessary to appease everyone so no more upset grandparent phone calls! I would use the printer, as say, a PRINTER! hahahaha LOve the cool features! I’d so love this new WIRELESS HP all in one printer for both my work and personal projects as I’m all wound up in connection wires from my current printer. It’s amazing I was able to even type this message actually!! I have a son who just started college and this printer would be perfect for him!! I would love to make a Picture book for my father-in-law for Christmas! 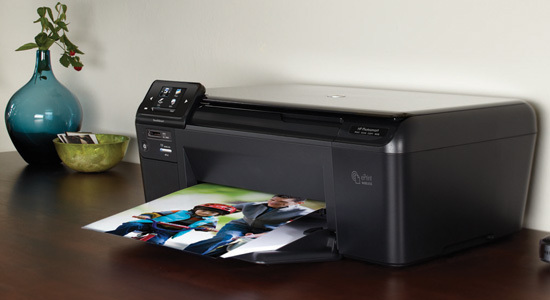 I would finally print out photos of my kids with the HP Photosmart printer! I hope I win. I would like to print out enough copies of pics of my mom and her beau for my brothers and sisters. Mom’s 74 and her beau is 85. I would love to have this as a second printer and, because it’s wireless, it doesn’t even have to be in the same room as the other printer (don’t want it to get jealous!). I am signed up, and I would use this prize to finally get prints of all these digital photos taking up space on my camera! Would love the new HP printer & be able to print from any device or anywhere would be a much needed option for small growing family. I would love to use this printer and/or the Snapfish card to print photos (and maybe some of those nice photo coasters) of our family’s recent mission trip to El Salvador. We have so many pictures to print! I’ve been planning on creating a family history/scrapbook of sorts, and as such have text to print, photos to scan, and reprints of many family photos to order. The All-in-one, combined with the services from Snapfish, will make easy and quick work of an otherwise daunting project. What a wonderful opportunity to jump start my genealogy project! It’s time to put all of those family pictures and stories together to leave a legacy for our eight grandchildren! The HP printer and the Snapfish package would be a fantastic aid for the project ... thanks for the opportunity! I love the fact that I can print from any device any where. Would love to have!!! This is what I would do if I won! If I won the printer, I would print up all the photographs currently living on my hard drive…LOL! If I won the Snapfish card, I would make a photo book for my son to have with him as he starts his life as a U.S. Marine. I’d love to use the photo printer to use in my workshops for low-income women. My two young granddaughters live 1,100 miles from me. Their parents have a snapfish file which I visit often to check on new photos. Snapfish has some wonderful merchandise available. What a treat it would be to win a $50 gift card for Snapfish goodies! I would use the new printer and/or gift card to replace the old HP printer I already own. Mine is a good printer, but it is very old and needs to be updated!